Salhouse is a parish situated in the Norfolk Broads to the northeast of Norwich. Wroxham and Hoveton border it to the north, with Great and Little Plumstead to the south. The name Salhouse derives from the Old English meaning ‘Sallow willows’, suggesting that a willow wood may have existed here in the past. Unusually, the parish is not mentioned in the Domesday Book of 1086, and the reason for this is not known. Perhaps Salhouse had not been established at this time or was too small to merit a mention. Alternatively it may have been included (but not named) as a part of one of Wroxham, Hoveton, Rackheath, Woodbastwick or Great and Little Plumstead, the parishes that surround it. Whatever the case, modern Salhouse is a pleasant place and a designated conservation area, with Salhouse Broad a rich area for local wildlife. The earliest find from Salhouse is a Palaeolithic handaxe (NHER 8462) that was found in Street Wood in the early 1920s. A number of Mesolithic finds have also been recovered from the parish including tranchet axes (NHER 31368 and 40114) made from flint as well as a scatter of microliths (NHER 8426) – widely recognised as the characteristic find type of this period. It has been postulated that some sort of Mesolithic site existed in the area from which the microliths were retrieved, but sadly no further evidence exists to corroborate this claim. Rather more finds from the subsequent Neolithic period have been recorded. These take the form of flint tools such as axeheads (NHER 8463, 8464 and 8468), knives (NHER 8465), scrapers (NHER 24235) and a chisel (NHER 8058) found to the west of Hospital Farm. Moving into the Bronze Age and Iron Age there are considerably fewer finds. However, several ring ditches (NHER 45115 and 45116) have been noted on aerial photographs and these are likely to date to the Bronze Age. The few finds that have been recovered include Bronze Age axeheads (NHER 8469) and an arrowhead (NHER 8470) and Iron Age pottery sherds dredged from Salhouse Broad (NHER 44133). A fairly typical selection of Roman artefacts has been discovered by metal detector surveys across the parish. A couple of nice brooches have been found, with one identified as a disc brooch (NHER 37258) and the other as an example of the Colchester Type (NHER 19019). Various coins (NHER 8471 and 24001) have also been recovered but these represent the sum total of the finds. No definite Roman sites have been found, but a rectangular enclosure located northeast of Oldfield on the Stonehouse Road (NHER 18128) may be of Roman date. Disappointingly, no Saxon objects have been retrieved from Salhouse. This may not necessarily mean there was no Saxon presence or activity here. Instead, this absence may merely indicate that artefacts from this period await discovery. All Saints’ Church (NHER 8500) dates to the medieval period and is the earliest standing structure that survives in the parish. This striking building dates to the 13th/14th centuries but is unusual because it was never fully finished, illustrated by the incomplete top of the west tower. Will evidence shows that the 16th century Reformation, with its removal of the need for bequests, interrupted the funding for the work. However, Some later restoration did occur here and the exterior of the nave, chancel and south porch all date to the Victorian period. One of the delights of All Saints is that its interior is as eccentric and curious as the outside. Visitors should take note of the fine octagonal font brought here from Woodbastwick, the carved poppyhead benches and unusual hourglass stand fixed to the pulpit. The only other building with medieval origins is The Lodge (NHER 13356), formerly know as Salhouse Old Rectory, which incorporates parts of a medieval parish barn from Wroxham. Some evidence of medieval agricultural practice survives in Salhouse. We also know from the archaeological evidence shows that peat cutting occurred around Wroxham Broad (NHER 44123), Salhouse Broad (NHER 44124) and along the River Bure (NHER 13517) during medieval times. Possible medieval field boundaries and pits (NHER 49168) have also been noted as cropmarks on aerial photographs taken in 1990. A varied collection of medieval items have been found here that comprise, amongst others, an incomplete Jew’s Harp (NHER 19019), seal matrix (NHER 37258), part of a rotary key (NHER 40114), coins (NHER 24002 and 33632) and fragments of medieval window tracery (NHER 25317) used as mud weights in the Broad! The records for the post medieval period show an expansion in agricultural and industrial activity. Documentary evidence shows that in the 18th and 19th centuries Salhouse was involved in brick production, with a brick kiln (NHER 15445) located east of Broad Farm Cottage and a brickyard (NHER 15491) situated to the south of Honeycoombe Farm. Two windmills are also noted (NHER 43124 and 43125), one of which (NHER 43125) sat atop Mill Hill, the probable provider of the hill’s name. Trading of these manufactured goods was aided in the late 19th century by the establishment of the Cromer Line of the East Norfolk Railway (NHER 13586). This line ran from Norwich to Cromer, passing through Salhouse, and was completed by 1877. When discussing the buildings of the post medieval period two examples stand out: Salhouse Hall (NHER 8498) and The Grange (NHER 31053) on Lower Street. The hall has Elizabethan origins but little of this architecture is now visible. The present building is of 19th century castellated brick with angle shafts, turrets and a porch tower. Other associated buildings that have been identified include stables, schoolroom, kennels, a coach house and a derelict dovecote (NHER 8499). Sadly the house now stands semi-derelict. In contrast, the impressive Grange survives in far better condition. It has a three cell form and dates to around 1600. However, in the 18th century a very grand block with ornate detailing was added to the building. Further alterations were carried out in the late 19th century when porches and extensions were built. The majority of the rest of the buildings from this era are charming 17th century farmhouses. Examples include Shrudlands Farm House (NHER 45673) on Upper Street and Broad Farm House (NHER 46037) on Vicarage Road. The other building of interest, the Baptist Chapel on Chapel Loke (NHER 45659), is a later construction dating to around 1800. This square building is made from red brick with a pyramidal pantiled roof. However, the meeting room/vestry on the south side is a later addition. Of course a number of post medieval finds have been recovered from Salhouse. Most are fairly mundane items like cloth seals (NHER 37258) and lead weights (NHER 40113) that would have been related to everyday activities. However, a single copper alloy tobacco tamper (NHER 19019) has been found and it is easy to imagine its owner puffing on his pipe after a long day's work on the land. The most recent archaeology on record relates to World War Two. 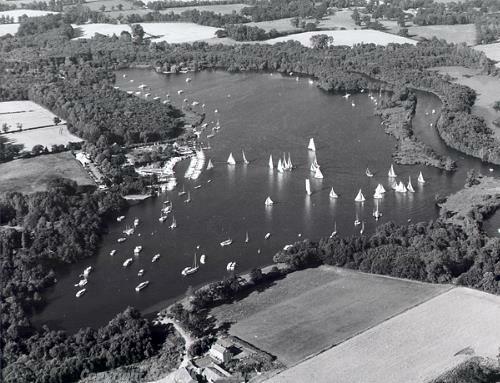 1946 aerial photographs show that the wreck of a boat (NHER 44132) was positioned in Salhouse Broad during wartime to prevent enemy seaplanes landing here. It was still visible in 1995 when the broad was visited. The same set of photographs also show earthworks that possibly relate to a military training camp (NHER 45136). A number of pits were identified from the photograph and they might have been used for weapons training and as part of a course used for vehicle training. Thus concludes the brief overview of Salhouse. In order to get a fuller flavour of the parish’s heritage readers are advised to consult the individual records. Thomas Sunley (NLA), 15 February 2007.